The effects of Laser therapy are photochemical, not thermal. Photons enter the tissue and are absorbed in the mitochondria and at the cell membrane. The photonic energy is converted to chemical energy within the cell, in the form of ATP. Cell membreane permeablity alters, then physiological changes occur. These affect macrophages, fibroblasts, endothelial cells, mast cells, bradykinin and nerve conduction rates. Cellular reaction to photons is very similar to photosynthesis in plants. Rapid cell growth. Laser accelerates cellular reproduction and growth. Faster wound healing. Laser stimulates fibroblast development in damaged tissue, reducing recovery time. Increases metabolic activity through higher outputs of specific enzymes, greater oxygen and food particle loads on blood cells. Improves immune responses. Reduces fibrous tissue, reducing the formation of scar tissue following injury or surgery. • Anti-inflammatory action for improved joint mobility. Increases vascular activity. 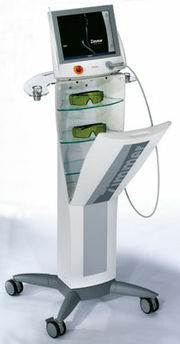 Laser stimulates lymph and blood circulation. Lasers stimulate the process of nerve cell re-connection to bring numb areas back to life. Laser increases the amplitude of action potentials to optimize muscle action. 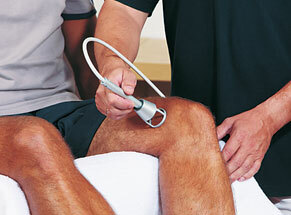 Laser Therapy is available at our Port Coquitlam Clinic only. There are no extra charges other than usual Physiotherapy fees.